When holiday "ho-ho-hos" turn to the winter "ho-hums," it's time to take down the tree. Whether you do it on New Year's Day or closer to Valentine's Day, this chore is as much fun as unpacking after a trip to Disney World — not many laughs but somebody has to do it. So put on your favorite tunes, boogie on over to that evergreen and get started. If you follow these great tips from Debra Johnson, home cleaning expert for Merry Maids, you’ll have it done in record time! For easy and safe storage, Johnson suggests gluing plastic cups to strips of cardboard and stacking them in a box, placing an ornament in each cup. Another option is to hack wine/liquor cases and use the built-in divided sections for stacking ornaments. 1. Spread the sheet under the tree and place bath towels around it to protect falling ornaments. 2. Remove items in the reverse order that they were placed on the tree: garland first, then ornaments, lights and tree-topper. 3. Place each length of garland in a separate zip-top plastic bag. 4. Non-breakable ornaments can be placed, as is, into a gallon zip-top bag. 5. Breakable ornaments should be stored in a divided, ornament-storage box. You could also use a regular box, but make sure ornaments are wrapped in newspaper, paper towels or bubble wrap. (It’s worth the extra time. You don’t want another three-legged donkey on the tree, do you?) Place in storage container. 6. Store tiny ornaments in egg cartons. 7. Plug in the tree lights and replace burned-out bulbs. If the lights are removable, start from the top and work your way down. Wrap each string of lights around a separate piece of cardboard or a roll of newspaper. Tuck in the end of the string to keep it from unraveling. 8. Wrap the tree-topper in bubble wrap and store with the ornaments. 10. Drain water from the tree stand using a wet/dry vac or a turkey baster. Blot up any remaining water with a towel. Or, do it the old-fashioned way. Spread the sheet to its full size, removing the towels you put there to catch falling ornaments. Lay the tree onto the sheet and remove the tree stand. Wrap the tree in the sheet and drag it out the door, bottom first. Most communities pick up Christmas trees for recycling, so check out pick-up days in your area. If you have an artificial tree, flatten all the branches so the tree will fit more easily in the storage box. 12. 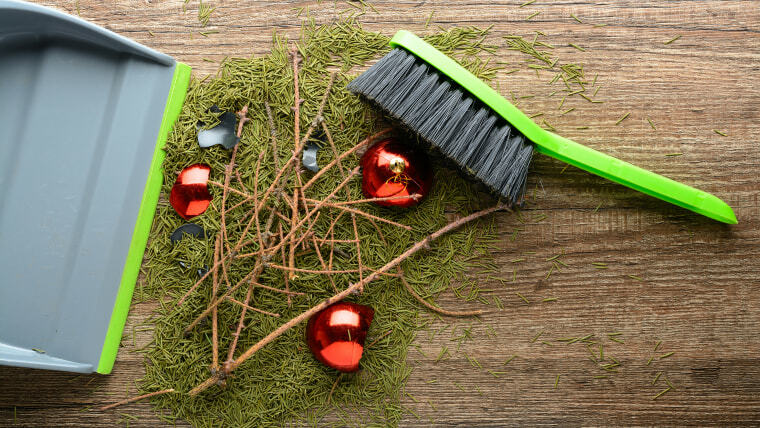 Johnson recommends using a vacuum cleaner to remove stray pine needles and a lint roller to capture pieces of glitter and broken ornaments. 13. If there’s any tree sap on the floor/carpet/upholstery, Johnson suggests applying a small amount of a clear "spirit", such as vodka or gin, to a dry microfiber cloth. Gently blot this over the area until the sap transfers onto the cloth. If this doesn’t get it all, mix a teaspoon of detergent into a cup of warm water and blot the stain with the solution. Allow this to sit for at least three minutes before blotting with a new cloth. Repeat as needed. Check out these other tips for removing tree sap. Note: If there’s any of that “spirit” left, you may want to toast yourself for doing a great job. Cheers!